DONATIONS NEEDED: ELKS DISASTER RELIEF PROGRAM!! Today is a proud day to be an Elk! As you may know, Grand Lodge made a $25,000 donation to support those affected by catastrophic floods in Texas!! Grand Lodge was able to make this donation due to the existence of the Elks Disaster Relief Program! 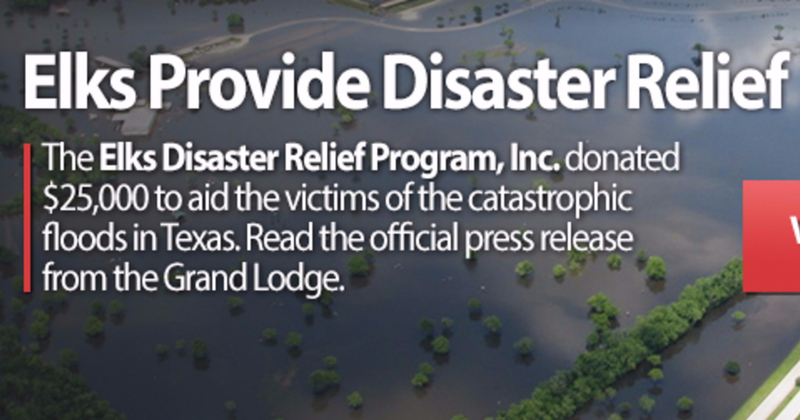 Because this program exists, Grand Lodge was able to provide relief immediately. However, this large donation leaves the fund severely depleted. Please consider donating to help replenish this emergency fund, to ensure that there are funds available for a future catastrophic event! Thank you in advance for your generosity!! or click button to donate directly.